There is a sort of smug contentment that goes with the idea that we are the church that preaches the three angel's messages. We like to think of ourselves as the chosen ones. 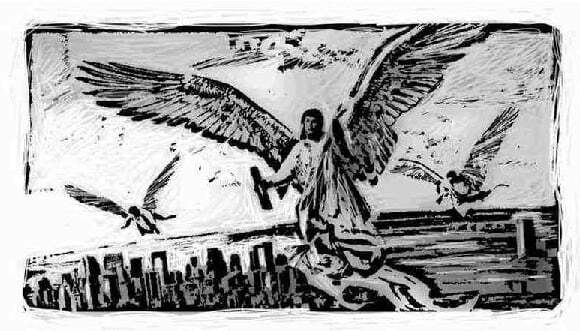 We even create symbols for letterheads, publications and even adorning our churches representing the three flying angels blowing trumpets, reinforcing the idea that we embody that message. It is a grand and noble thought, but is our contentment really complacency? Have we really thought of the consequences and challenges of living up to the symbolism? This week we are studying a familiar theme. For many of us it is the part of the book of Revelation we know best. Are we going to read and study this passage, nodding our heads in affirmation or are we going to rise to the challenge and live the message in a way that really shares the Gospel? Could we say the "election" does not come as a default result of baptism after agreeing to a set of truths? It is rather the result of those truths possessing the heart, and thus the life of the one possessed by them. This will result in a "new creature", rather than a mere paint job over the old creature who still follows the former path, but not the Lamb. The Revelation is very specific in revealing the true servants of God, and will help us to "examine [ourselves]" in the True Light(2 Cor 13:5). If your car's number plate is 666? If you wake up one morning and find 666 written on your forehead? If you're given alot of money but it's written 666? The worshippers of the beast receive a mark on their right hand(deeds) and on their forehead(mind). Forehead (mind) = today is Sunday. Hand (deeds) = I won't work. The mark is not the literal number 666. You put it on yourself by just believing, today is Sunday I won't work. Don't be scared by the number 666. It is a number of a man not of a car, computer or anything else. Jesus tells us to calculate the number of the beast. Have you ever done that? To make a long story short he later had a transient stroke, decided to be a committed Christian and became baptized. I had the privlage of attending his baptism, the pastor asked him to speak and he said with a big smile on his face, I want to go where my wife is going. That for me is one of those mountains that stand in the way of Satans deceptions. Christ life, death, and resurrection, especially sitting at the feet of Jesus, Christian family, and friends, Christian education, Christian preachers, teachers, assuming they speak according to the Word of God. Hey you can at least find one of those mountains if you give into the goading of the Holy Spirit. I should say not Gods counterfeit, but God’s answer to. Cyrus, I already don't work on Sunday, I have gone to church on Sunday when we had an evangelistic series, I certainly pray and praise the LORD and study my Bible on Sunday and see no problem with those. However if I was told I must work on Sabbath or lose my job then I would not do that. I don't even have to go to church on Saturday to honour and worship the LORD, in fact have often not done so because I have not been able to physically. So other than economic sanctions how will the Image of the Beast force me to worship the Beast? Only the blood of Christ can cleanse keeping is by heart and mind only the humble spirit will submit to the true living holy lord amen. The worshipers of the beast will receive the mark on their right hands or on their foreheads, symbolic of their choice to serve this apostate system with their deeds and/or minds. As we move further and further into Post-modernism, we become more and more secular and less and less religious. If the Mark of the beast is about worshiping within a Sunday-based apostate religious system, what happens to those who don’t have anything to do with religion? Do we need to broaden our view of what the mark of the beast constitutes? Is the issue confined to serving an apostate system - as the lesson has again suggested? Or is an apostate system merely one of many systems that are all based on and characterised by self-serving rather than self-renouncing? What if we go a bit deeper into the issue of who we worship. We worship what we admire. We admire what our hearts desire. There are only 2 classes of desires: self-renouncing/other-centered vs self-indulging/self-centered. And there are 2 matching Kingdoms: the self-renouncing Kingdom of God that alone leads to life eternal and abundant vs the self-indulging Kingdom of Darkness that alone steals, kills and destroys. Consequently, everyone is essentially worshipping every day of their life - even those who have nothing to do with religion. I would propose that, fundamentally, the end time issue will not be as narrow as which religious system a person is part of. Rather, I would suggest that the fundamental issue will be (and always has been) which Kingdom’s nature and character have they set their heart’s desire upon and are therefore devoted to (‘worship’). Let me toss this into the discussion: what options do we have regarding the object of our worship? How many options are there in reality? Answering this might help in understanding what worship is and how it is manifested in one's daily life. I thought Phil laid the options out clearly: Either we worship God Who forms His self-renouncing love within us, or we worship self, which manifests itself in many self-serving forms. Do you think it might be possible to be a Sabbath-worship-attending Seventh-day Adventist while still having self on the throne of the heart? Only 2 options: self-renouciation/beneficence/Agape love or self-seeking. But perhaps you have a point you wish to raise? Inge, I'm sure we both realize that one only needs to be alive and capable of making a choice, regardless of any membership or lack of it. Membership will never offer a saving relation, as it exists for the purpose of those saved to serve. Yet we can join while unsaved and still serving self. Seems you both agree that no one really lives/acts to honor or worship the devil, who prefers to remain unnoticed at this time. So how does the world worship the dragon/beast? Wouldn't it would be their agreement with their manner of denying God His sovereignty in their daily life, and their work to lead others to follow their example? The mark of the beast is very specific, yet it will be the means of exposing all who deny God through self-preference, no matter what they do or don't believe. As for what worship actually is, I find an interesting definition of worship when comparing Revelation 13:8 and 17:13. It revealed to me how easy it was to be worshiping self while "knowing not" my true condition. "Buying" the eye salve from the True Witness leads us to wake up, like the prodigal son, and realize just where we actually are. Seems you both agree that no one really lives/acts to honor or worship the devil, who prefers to remain unnoticed at this time. That would be a false assumption/assertion, so I will clarify. All whose heart's deepest desire is self-seeking are already in harmony with (essentially 'worshipping) the devil - whether they know it or not (Matt 12:20; 1 Jn 4:7, 8). We worship (effect) that which we admire (cause). We admire (effect) that which aligns with our desire/s (cause). So how does the world worship the dragon/beast? Wouldn't it would be their agreement with their manner of denying God His sovereignty in their daily life, and their work to lead others to follow their example? Self-seeking does that by default. Our world (thanks to the tireless efforts of Satan) is is 'hell-bent' on cultivation of self-seeking in a million different ways. The mark of the beast is very specific, yet it will be the means of exposing all who deny God through self-preference, no matter what they do or don't believe. The mark of the beast is not something that will come at some point in the future. It has always existed from the moment Lucifer became Satan. It is the self-preferring nature and character that has 'infected' all those whose deepest heart's desire is that self-preferential nature and character (eg Gen 6:5). Consequently, I would propose that, fundamentally, the end time issue will not be as narrow as which religious system a person is part of or which day they are attending worship services. I am not saying this wont happen at all. Rather, I would suggest that the fundamental issue will be (and always has been) which Kingdom’s nature and character have they set (irreversibly "hardened") their heart’s desire upon and are therefore devoted to living in accordance with on a day-to-day basis (‘worshipping’). Isn't the Bible very clear on who the beast represents? Isn't it's "mark" a given reality that stands well supported by scripture/history? Keep in mind that all those who claim to be without "religious" affiliation, the Bible states clearly that they will comply when the demand is made with severe consequences for non-compliance. The all-gold image on Dura was very specific, as is the beast and its mark, and we read that all who's names are NOT written in the Lambs book of Life will worship the beast, his image, and receive his mark, one way or the other. No neutral position will be allowed. Keep in mind who(the dragon) is behind all of this charade, and he is the grand master of coercion, though he will fail on his last attempt. Keeping in mind that the 4th Commandment is largely about resting instead of working (Exodus 20:10), how will retirees or the disabled be "tested" if working on Sabbath is the sole test to distinguish those who follow the Lamb from those who follow the dragon? Only about 60% of the US population works at present. Does that mean the other 40% will not be tested? Can I just retire when the “Sunday Law” is passed by congress? What of the elderly at Dura? Prior to the pastor’s prayer in my church, the congregation is told “all who are able please kneel for prayer.” Almost half of our members are unable to kneel. Were the elderly or those in wheel chairs at Dura given a pass? I continue to have trouble accepting the “Sabbath test” doctrine on the above and other grounds (e.g., our SDA hospitals still perform elective abortions and we are going to convince the world that keeping the 4th commandment will determine their eternal destiny?). Sieg, the arguments you present have been used before against the significance of the fourth commandment. I think we need to remember that "Sabbath keeping" is much more than not working. We cannot "keep Sabbath" without resting in the Lord of the Sabbath. But on to the "test." Seeing the end-time scenario is clearly about worship, (Rev 14:7) can you think of any other visible test that more clearly divides the faithful followers of Christ from the self-serving multitude? The Sabbath is about total trust in the Redeemer for salvation. The commandment, set in the heart of the Decalogue, is clear and compelling. It tells us that God, as our Creator, is worthy of worship, and it outlines a little of what that means. By contrast, the Roman church has long declared Sunday keeping as the mark of its authority. Keeping Sunday will be accompanied by favors and acceptance, while Sabbath keeping will be proscribed and will endanger life itself. Thus, Sunday keeping is in line with self-preservation and self-focus. Sabbath keeping is aligned with quite literally dying to self. There will be no nominal Sabbath keepers when keeping Sabbath will endanger life. Only those who truly put all their trust in the Lord will keep the Sabbath in that day. I am quite confident that the issues you bring up will not prevent the test of loyalty coming to every soul. You are quite right, though, that currently there may be more important issues for the church to address than which day to keep. But then the "which day" isn't all that clear-cut either, with a significant number of Seventh-day Adventists worshiping on the first day of the local week in the South Sea Islands, at the express advice of a division of the General Conference. I am not maligning the significance of the Sabbath but wonder if there must be other ways for our faith to be tested. I certainly don't know the answer but agree that who (not when) we worship will be and always has been the test of our faith. In the end, God will judge our hearts so it really doesn't matter what the world thinks or how the world judges us. I do think we need to keep studying the Bible to know the truth instead of relying primarily on theologians and other "experts." Incidentally, I have been to Tonga and can say that the Adventists there are sincere and true to their conscience, whatever side of the date-line controversy they are on. I believe we should thus honor their individual choices without judging them. Ah, Sieg, how I would love to be able to go to Tonga and Samoa and meet in person some of the beautiful people I have known only online! I think the principle of "honoring individual choices without judging" applies to all our dealings with Sunday keepers wherever we find them and anyone else whose understanding differs from ours. At the same time, Christ has made it clear that He expects us to share what He has done for us and to "teach all nations." It seems to me that the teaching part should not be dropped just because some already call themselves Seventh-day Adventists. The Holy Spirit will impress people who are truly His, but He usually uses human instruments to do the teaching, though there are exceptions. Yes, I'm sure different people are tested different ways. But, still, we have the prophecies that point to a crisis over worship. And when we parse out the symbols, they point to genuine Sabbath keeping - resting fully in the power of Christ to save. Sabbath rest does include physical rest—on the seventh-day of the week; however, physical rest is not the primary application of the thought of rest. The Sabbath rest is a rest from our labors of trying to provide ourselves with fig leaf garments of righteousness. The seventh day of each week is a simple reminder of our dependence on God for every aspect of our salvation from sin. You've probably seen the saying, "Do your best, God does the rest." That saying is a lie direct from the devil himself. As we've been reading here in Revelation, there is "no rest" (Revelation 14:11) for those who have never learned to "rest" completely in God. First day worship is a symbol of man's attempts to clothe himself with righteousness and can never represent anything other than a pale attempt at righteousness by works. In their wilderness wanderings the Jews failed to find the longed-for rest of righteousness that comes only by faith (Hebrews 3:18, 19). In the day of Christ, the Jews (who were devoted seventh-day worshipers) failed to find that same longed-for rest. For us today, we too seek for rest—the rest that comes only from believing that it is God alone who provides us with Christ's robe of righteousness. God has already done the giving. It is now time for us to believe that it is true and learn to rest in Christ, throughout the week, but especially on the seventh-day Sabbath for it is a weekly reminder of our dependence upon the Creator God for everything we have and are. Consistent with what you have outlined, while we 'Sabbath' on 'the Sabbath' in particular, 'Sabbath' is more broadly a total 24/7 way of being in our orientation towards God - recognising and willingly embracing the reality that, as His creation, were are absolutely and completely dependent upon Him for life. And that is a good kind of dependence. The entire world was not on the plain of Dura that day. Everyone ‘worships’ that which is in accordance with their heart’s desire even if they literally don’t bow down to any image. Gen 6:5 is the evidence I offer in support of this point. The second coming scenario will share much in common with what occurred in the days of Noah - more than we’ve typically considered. Perhaps you miss the point concerning the plain of Dura? All but 3 bowed, though it was not a personal conviction to do so. It is a type of what will happen when Rev 13 becomes reality. The valid point is that it won't matter if you don't go to church at all today, on that day, you will. No one will refuse except those who stand with Christ, following wherever He leads. Say among nations the LORD reigns! The study of Revelation should leave us in a better position to understand the necessity of obeying God's word. This is the only way that can keep us from receiving the mark of the beast. We can't properly keep the Sabbath according to the will of God without keeping all the ten commandments, James 2:10. The fact that the seal of God is to be placed only on the forehead means that there has to be a deep understanding of His word not just a blind submission (a mark on the right hand) as did the rich young ruler, Luke 18:18. Through the Revelation God has laid open the devil's plans for all those who do not realize the solemnity of our time and have no plans for their own lives. His anger against Christians and the amount of effort that he is putting for his last kicks should lead us to seek a deep relationship with Christ. As we realize the danger posed by all his countless devises, we should pity those who are wandering in error. I believe God is seeking to prepare us for the final battle against the Dragon. The frightening imagery and language of the book are not meant to scare us. They only depict the intensity of the controversy. This is a serious warning and it needs to be clearly understood by everyone involved. Forewarned is forearmed! What do you reckon the “deep understanding of God’s word” is - the deep understanding or “one thing” that the rich young ruler lacked? The kind of understanding that enables one to exercise mercy. When God writes His law in our hearts and minds our lives will produce the fruit of His Spirit, Gal 5:22,23. This fruit is the one that fulfils the law. This is why Christ told him to minister to the needy because this is the only way that we may know that we are saved, ' by their fruits ye shall know them'. So perhaps the rich young rule only knew of the (superficial) letter of the law but was ignorant of the deeper understanding (a ‘heart’ understanding) of the Spirit of the law - the Spirit of self-giving love? Exactly. Unfortunately that's what most of us are doing today. Both Daniel and the Revelation depict the faithful remnant as a small minority among the apostate inhabitants of earth during its closing events just before Jesus comes to save them. Though all will have heard and recognized the Truth, most will act out of unbelief(2 Thess 2:10-12), being deceived by the popular opinion and the coercive force that will quench the conviction of all but those who's names are written in the Lamb's book of Life. Few are they who will stand apart when threatened destruction hangs over their head. Take note that where we stand today will most likely be where we stand in that hour(Remember Lot's Wife!!! )if no true change take place. Laodicea does not know it's true need until it receives and acts upon the counsel of the True Witness. This alone will lead to the condition described in our memory verse today, and in the first 5 verses of Revelation 14(How are these critical verses omitted from the lesson?!). This condition described is the result of experiencing “the power of God unto salvation to everyone that believes”(Rom 1:16). Anything less than this will result in eternal loss in that hour. The Remnant of God's people will reflect Jesus fully in that darkest hour(Isa 60:1-3). I am all for the three angels messages, but we have lost something by jumping into it right after the study we had last week. What do I mean? We have gone through two lessons describing a drama of war and challenge to God. It concluded with the beasts as the dragon's allies about to pounce upon the remnant. The next chapter does not open with the three angels messages, it opens with the Lamb and the 144,000 upon Mount Zion. That is the conclusion, in a sense, of the drama unfolding previous. Though Satan will employ all of his wrath upon the remnant in a global deception of all worldly institutions there will remain a loyal people, those that follow the Lamb withersoever He goeth! It would be a good time to review chapter 7 and rejoice in the victory on display in the first part of 14. It is after that that we should place the messages in context that lead to the culmination in Jesus' return and the harvest depiction of the faithful and wicked.